After the Senate GOP released a massive tax cut bill for the the wealthiest Americans disguised as a health care proposal, which the Congressional Budget Office (CBO) projected would kick 22 million Americans off their insurance, drastically cut spending on Medicaid, and raise premiums on seniors, Fox News used the opportunity to lie and spin on behalf of the Republican Party. For example, Fox hosts and guests have mocked legislators who correctly pointed out that the Senate bill would increase mortality rates in the United States. Additionally, hosts and guests claimed that millions not having health insurance is “the American way,” lied that Medicaid wouldn’t be cut by the bill, and attacked former President Barack Obama for speaking out against the proposal, which would reduce all of the gains in insurance coverage his signature law created. MIKE DARDIS (CO-HOST): Well, Republicans can’t seem to agree on the best way to repeal and replace Obamacare, a promise several years in the making. SHEREE PAOLELLO (CO-HOST): The Senate is expected to vote on this newest health care bill a little bit later this week, but some new numbers out this evening may not help convince the holdouts. SEN. CHUCK SCHUMER (D-NY): CBO’s report today makes clear that this bill is every bit as mean as the House bill. REPORTER: Twenty-two million -- that’s how many more Americans would be without health insurance by 2026 if the proposed Senate GOP health care bill passes, according to the Congressional Budget Office report. Like the House version of the bill that passed in May, this version would end enhanced Medicaid expansion, eliminate coverage mandates, and allow insurers to charge older policyholders more. Premiums would be down about 20 percent over the next 10 years for the average customer. The U.S. deficit could also by cut by $321 billion. But those in the individual market would be hit with dramatic increases for services. Senate Majority Leader Mitch McConnell is scrambling now to shore up votes for the bill, but these numbers may not help. SEN. LINDSEY GRAHAM (R-SC): From a political point of view, if you had a problem with the bill, the CBO score didn’t help you at all. It’s going to be tough to get to 50, but time will tell. REPORTER: Senate Republicans unveiled their version of the Obamacare repeal last Thursday to an underwhelming response by many in their own party. 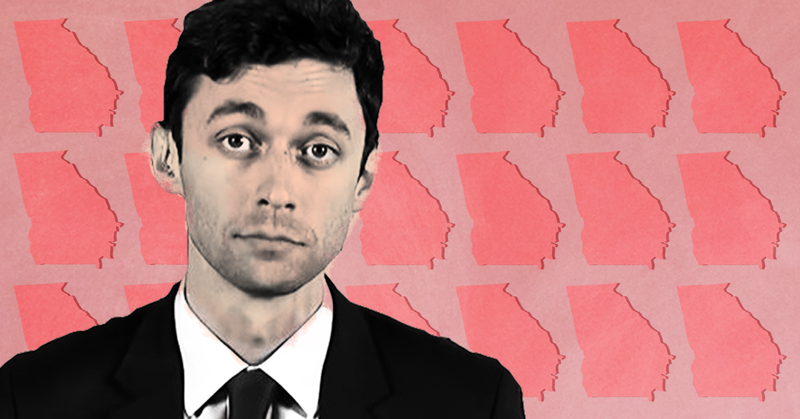 An attack ad against Georgia Democratic House candidate Jon Ossoff repackaged right-wing media myths about Syrian refugees, falsely claiming that the United States does not have a sufficient screening process for refugees and is allowing ISIS to infiltrate the country through the refugee program. In reality, the United States’ screening process for refugees is one of the most robust in the world, and no Syrian refugee has ever been involved in a terror attack in the U.S. The May 31 attack ad by the National Republican Congressional Committee (NRCC) claimed that members of ISIS are “infiltrating America and using Syrians to do it.” It also cited right-wing website The Daily Caller to claim that the United States doesn’t have proper screening measures in place. This false information is some of the same rhetoric spewed by right-wing media when it comes to Syrian refugees. Right-wing media have consistently opposed U.S. entry for refugees fleeing war-torn Syria. Often they claim that the refugees have “no paperwork” and therefore cannot be properly screened to ensure that they would not commit terrorist attacks in the country. Republican members of the House of Representatives on May 4 voted to gut the Affordable Care Act (ACA), passing a measure that would make it harder to obtain health insurance and allow states to opt out of requiring insurance companies to cover pre-existing conditions. While national cable media outlets focused on the “victory” the vote represented for President Donald Trump and the GOP or on the optics of the situation, some local media outlets in states where the impact of the legislation could be immense did a significantly better job at discussing how this bill would affect Americans. Many consulted experts to find out how gutting pre-existing conditions coverage and essential health benefits would make it harder for Americans to afford insurance. The New York Times’ Amy Chozick argued that President-elect Donald Trump should be given credit for using Twitter as he continues to avoid the press, normalizing his tweets as “refreshing” and ignoring the fact that Trump’s tweets have dangerously breached international precedent, swung stock prices, and promoted neo-Nazis, among other embarrassments. On the December 27 edition of MSNBC’s Hardball with Chris Matthews, Chozick joined a panel with Azi Paybarah of Politico and Caitlin Huey-Burns of Real Clear Politics to discuss Trump’s recent Twitter use. Chozick conceded that a president-elect should explain his policy positions in “more than 140 characters,” but still argued Trump deserves “a little bit of credit” for using Twitter to speak to his supporters because, according to her, President Barack Obama struggled to speak to his supporters early in his presidency. But Trump’s temperamental outbursts in 140 characters or less are far from praiseworthy by any reasonable standard and should not be a form of presidential communication or policy-making indulged -- or normalized -- by the press as Chozick suggested. As Greg Sargent explained in The Washington Post, arms control experts noted that Trump could exacerbate nuclear tensions in an international crisis if his tweets are interpreted incorrectly, such as when he recently tweeted that he wanted to “greatly strengthen and expand” the United States’ “nuclear capability.” Trump has already caused a serious strain in the U.S. relationship with one major nuclear power -- China -- after he bizarrely tweeted that he took an unprecedented call from the Taiwanese President (followed by several tweets attacking China). Trump has also used Twitter to bully American companies and citizens into submitting to his poorly reasoned demands and embracing his falsehoods. Trump sent the stocks of Lockheed Martin and Boeing into a freefall at various times earlier this month when he tweeted that he was going to cancel Boeing’s contract for the new Air Force One over cost and, later, Lockheed Martin’s over the cost of the F-35 fighter jet. In addition, after Trump falsely claimed he was saving 1,100 jobs at a Carrier factory in Indiana, he used his account to attack Chuck Jones, a union boss at the Carrier plant who pointed out that many people were still losing their jobs, prompting many Trump supporters to send death threats to Jones and his family. Chozick’s defense of Trump is another example of how media figures are normalizing Trump’s hostility toward and complete disregard for the press. Time and again since the election, Trump has broken serious norms, with members of the press enabling his behavior by sanitizing his ties to extremists, echoing his lies, and whitewashing his comments. While publicist Maria Sliwa attempts to mitigate the negative coverage surrounding Stephen Bannon, President-elect Donald Trump’s newly appointed chief adviser and the former head of the “alt-right” Breitbart News, one of the men she suggested could speak on Bannon’s behalf recently claimed that Japanese internment camps are Trump’s “precedent” for a Muslim registry. Thirty minutes prior to the final presidential debate, Republican presidential nominee Donald Trump advertised that he was airing a pre-debate program on Facebook Live. Given rumors that Trump’s son-in-law was shopping Trump for a TV show earlier this week, journalists noted this could be a “preview” of what could come. On October 17, The New York Times reported that Trump’s son-in-law, Jared Kushner, “discussed the possibility of a Trump-branded television network with a friend,” floating the idea of setting up a “Trump television channel.” Although neither Kushner nor Trump has confirmed the report, and apparently talks have not progressed beyond informal talks, conversation around this possibility has increased as Trump's support has decreased in the polls. Why Won't CNN Answer These Questions About Corey Lewandowski? CNN and Republican presidential nominee Donald Trump’s campaign are unsuccessfully attempting to defuse the explosive new details surrounding ongoing payments from the campaign to former campaign manager and current CNN commentator Corey Lewandowski. Hicks’ statements on Lewandowski’s role and CNN’s ongoing employment of someone who is still being paid in some form by the campaign leave several unanswered questions: Where is the money for severance documented, given that the Trump campaign filings call payments to Lewandowski “strategy consulting,” the same term that they used to describe his work while he was employed by the campaign for the last year and a half? Has Lewandowski been double dipping -- i.e. taking money from the Trump campaign for work while also receiving severance? Was CNN aware that Lewandowski was still receiving "strategy consulting" payments from the campaign? Most significantly, why hasn’t CNN suspended Lewandowski already -- or, better yet, fired him? A look at the timeline reveals that Lewandowski’s firing from Camp Trump occurred on June 20, or nearly three months ago. That’s a protracted severance-paying period, no? It sure is, says employment lawyer Debra Katz of Katz, Marshall & Banks, LLP. “The vast majority of severance agreements that we’ve negotiated are lump-sum payments,” says Katz, especially if the firms have the financial wherewithal to pay them. So structuring the severance payments over a number of months could be the approach of a cash-starved organization. There’s another motive, however. “It is not uncommon to string them out as a way to muzzle or control the person who’s receiving the funds,” says Katz. It's not just the recent filings in which Lewandowski was paid for “strategy consulting." According to Trump's FCC filings, Lewandowski has received the same type of payment for “strategy consulting” since April 1, 2015 -- before and after he was reportedly fired by the campaign and before and after he began his employment with CNN. It appears Lewandowski has never been paid directly by the Trump campaign, but instead those uninterrupted funds went to the firm registered to him. But the Post’s new report based on the new FEC filings highlights something different -- and far more damning. The July 6 disbursement to Lewandowski’s firm reported by the Post in August was a payment for the 2016 primary -- and could technically be for campaign work done in June, before he was a CNN employee. The newly discovered August 11 payment to Lewandowski is a “strategy consulting” disbursement for the 2016 general election, while Lewandowski was being paid by CNN to shill for Trump -- almost a full two months after he was supposedly fired by the candidate. So is Lewandowski being paid three times? Twice by the campaign, once by CNN, and all for the same job? Lewandowski will reportedly be on CNN later today. If neither the network nor the campaign can explain these discrepancies and answer basic questions about this ridiculous conflict of interest, maybe he will. On April 22, McAuliffe issued an order restoring voting rights to approximately 206,000 Virginians who lost them due to prior felony convictions. Nearly 13,000 Virginians subsequently registered to vote. But the speaker of the Virginia House of Delegates, William Howell, filed a lawsuit against McAuliffe seeking to stop the restoration of rights to this group of people, arguing the governor did not use his authority properly. The Virginia Supreme Court agreed, halting McAuliffe’s executive action and bumping those who had registered off the voting rolls. President Obama has charted new levels of executive defiance, but even he hasn’t refused to obey a Supreme Court ruling. Virginia Governor Terry McAuliffe has sought to follow Mr. Obama’s executive hubris, and now he’s gone further and is acting in contempt of the court that has rebuked him. The Democratic Governor claims he is restoring these voting rights by the thousands on an “individual” basis. And he says he plans to do so for all of the more than 200,000 remaining felons by the time his term ends. The Journal is no friend to expanded voting rights, especially when the denial of rights disproportionately harms minorities, as barring former felons from voting does. Its opinion pages have argued against the restoration of the Voting Rights Act and for restrictive Voter ID laws. Broadcast network news programs have ignored allegations that Republican presidential nominee Donald Trump’s modeling agency, Trump Model Management, “profited from using foreign models who came to the United States on tourist visas that did not permit them to work here,” as detailed in an August 30 Mother Jones report. The morning, evening, and Sunday news programs on CBS, NBC, and ABC have not reported on the allegations, even after Sen. Barbara Boxer (D-CA) called for an investigation into the model management company.